Need another gift idea? You’re going to love this one…it’s fast, easy, inexpensive, and adorable! 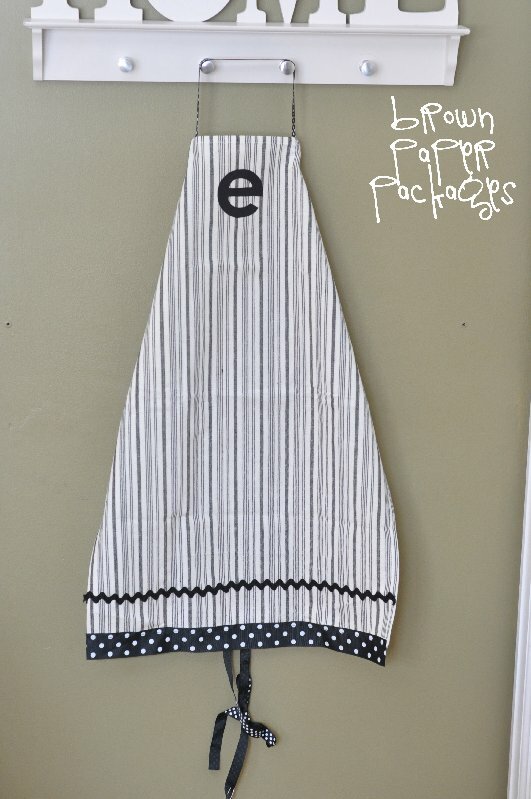 My super cute and talented friend Stephanie made the most darling tea towel aprons for a gift this year, and as soon as I saw them (I can’t resist anything monogrammed! )I knew I had to share! They are easy enough for even the most beginning sewer, and make such fun, personalized gifts for teachers, friends, or family. I can’t wait to make a matching set for my girls and me! 1. 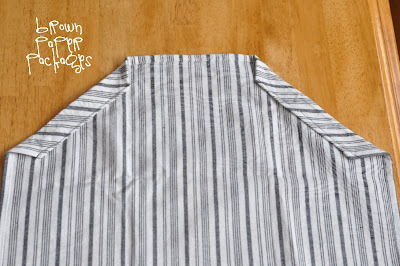 Iron the tea-towel and fold in the top corners. 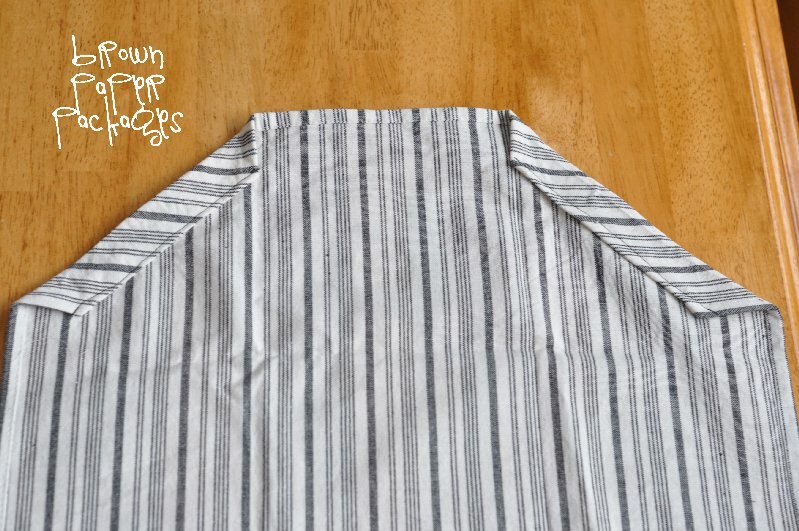 Trim the ends of the triangle and sew it along the edge. Leave enough room for the ribbon to slide through. 2. Sew ribbon on the bottom edge of the towel. 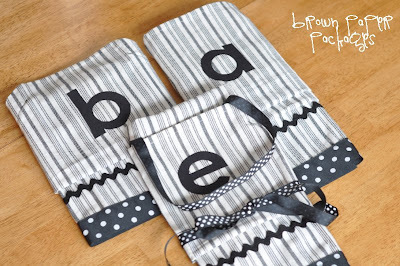 Add any extra ribbon/ ric rac by just sewing it straight onto the towel where you want it. 3. 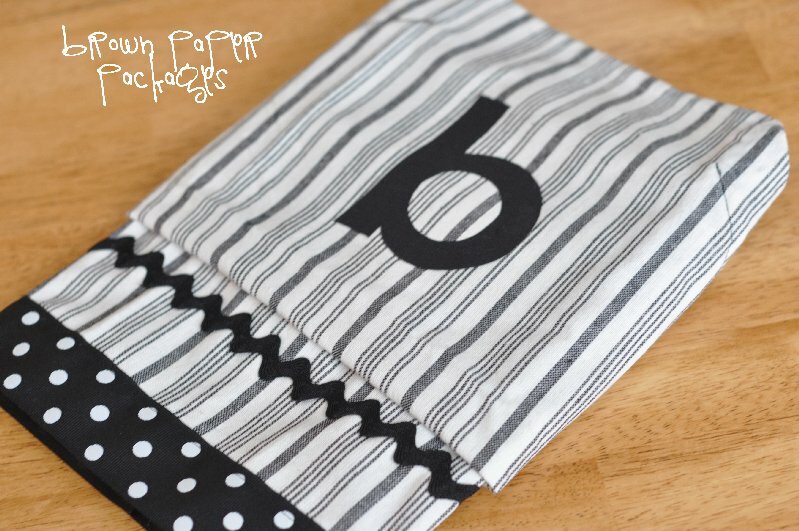 You can add pockets or any embellishments. I monogrammed each one by using heat n’ bond. After I ironed the contrasting fabric onto the heat n’ bond, I printed out a large letter, cut it out and pinned it to the heat n’ bond. 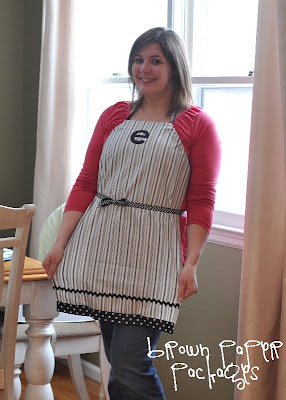 I then cut out the fabric letter and ironed it onto the apron. 4. To wear the apron, slide the ribbon through the corners, criss-cross the ribbon behind your back and then tie it in the front. Thanks so much Steph, for sharing your fabulous aprons! love how it looks on! Is there any chance we could get a picture of the back of the apron while on? I'm not getting the ribbon crossing. Thank you! love these! bookmarking it in my "find time to do" list! Where are some good places to find such towels? What size are "tea towels"? Great idea! how adorable! Love you clever ladies! I featured you today over at Sassy Sites! Come on by and check it out! Don't forget to grab a "fEatured BuTton"!! :) Happy Monday! 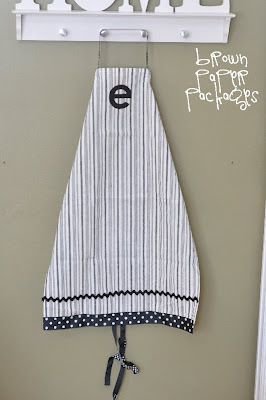 What is the size of the tea towel? Where did you get it at? I will have my friend measure the size for you, and get right back to you. She got it at a store here that's similar to Target or Walmart, but you could find one at any of those places, plus any store that sells dishtowels. It's basically the size of a large dishtowel.